At the time of Bishop Busch’s appointment, the diocese was well established and in excellent financial condition with no shortage of priests. By 1915 the people of Central Minnesota were settled into their careers and automobiles were showing up on city streets. In his first year, Bishop Busch initiated a project to build a new episcopal residence. Previous bishops of St. Cloud lived in the rectory at Holy Angels pro-cathedral. Instead of the rectory residence, Bishop Busch envisioned the French-chateau style building that currently serves as the chancery building on Third Avenue South. The project cost $45,000. To pay for the new building, Bishop Busch obtained a $30,000 donation from his mother, and an additional $15,000 from parish assessments. Bishop Busch, the first American and Minnesota-born bishop of St. Cloud, promoted social activism and was quite progressive. He supported the creation of the Women’s Guild and the Women’s Mission Circles. He initiated a diocesan convention to solicit input from lay Catholics. As bishop he even issued a directive that Sundays and Holy Days required at least one sermon in English, that confirmations would be conducted in English and that pastoral letters would be produced and read in English. 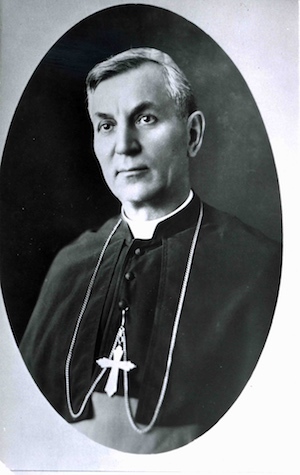 During the time of Bishop Busch, the growth of the diocese came to a halt due to the Great Depression. Between 1915 and 1924, 15 new parishes were established; from 1924-1942, the diocese did not establish any new parishes and did not build any new buildings.